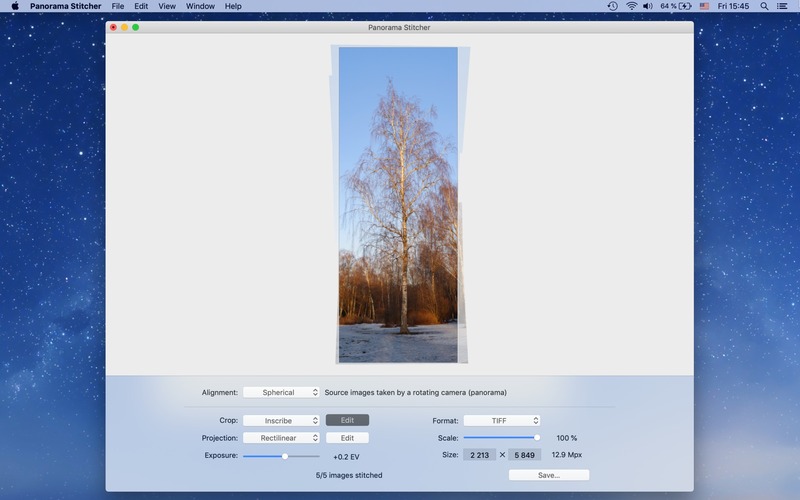 Is there a better alternative to Panorama Stitcher? Is Panorama Stitcher really the best app in Photography category? 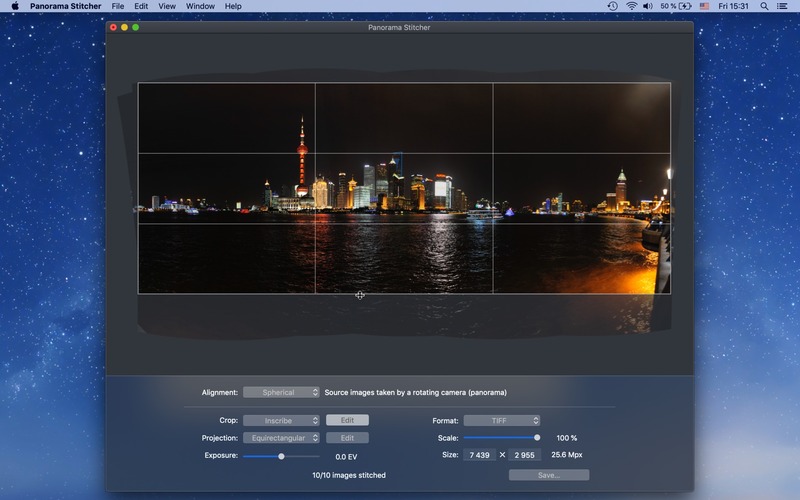 Will Panorama Stitcher work good on macOS 10.13.4? Panorama Stitcher is an automatic panorama-stitching application, perfect for making high-resolution images for large prints. Automatic alignment of source photos. Handling of moving objects. Inconsistencies between images at intersections are minimized. Automatic exposure levelling and lens-shading correction. Rectilinear and equirectangular projections for rendering. Accurate color handling. Output image is in the same color space as source images. Support for very large source photos. This feature enables stitching high resolution scans. Panorama preview in crop editor is now zoomable. Note that the preview still has lower resolution than the exported panorama. Preference for disabling exposure alignment added. Warning: disabling exposure alignment may reduce panorama visual uniformity. Panorama Stitcher needs a review. Be the first to review this app and get the discussion started! Panorama Stitcher needs a rating. Be the first to rate this app and get the discussion started! EXIF tags from source files are merged to output. Just drag-and-drop images to start stitching. All editing controls are at hand. 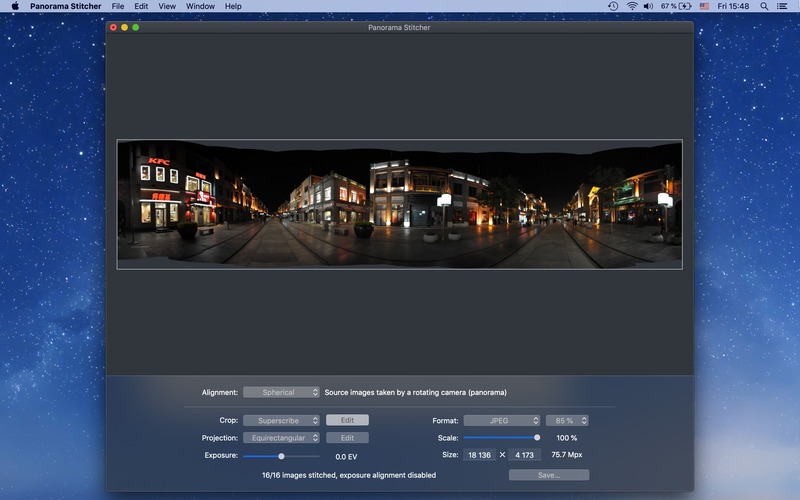 Straighten and rotate panorama as needed with projection editor. Hardware accelerated preview allows to see all changes in real time. Manual exposure correction and crop controls. Import in all image formats supported by OS X, including all formats supported by Apple RAW. Export in JPG, TIFF, and PNG formats. Export in TIFF format uses transparency outside of a panorama instead of opaque background color. Stitching performance on large (>30 images) source sets improved. Support for Dark Mode. Dark Mode in Panorama Stitcher can be enabled independently from system settings via menu View/Dark Mode. Cursor hints in crop and projection editor added. Several reported crashes on macOS 10.14 are fixed. Minimum required macOS version raised to 10.12.